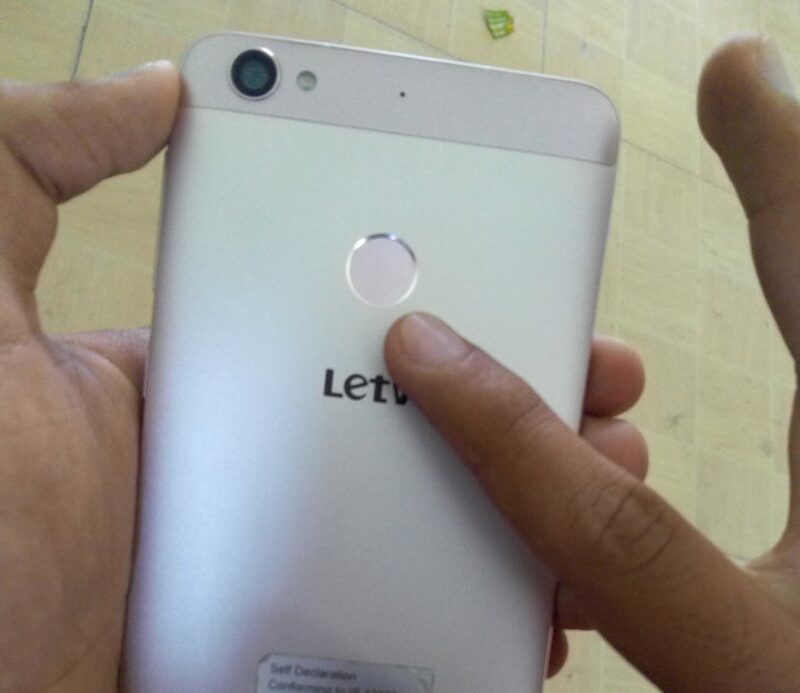 LeEco (formerly known as Letv) is one of the newest names in Indian smartphone industry. LeEco is a global brand, famous for its content services and ended up introducing smart phones, smart TVs and more. 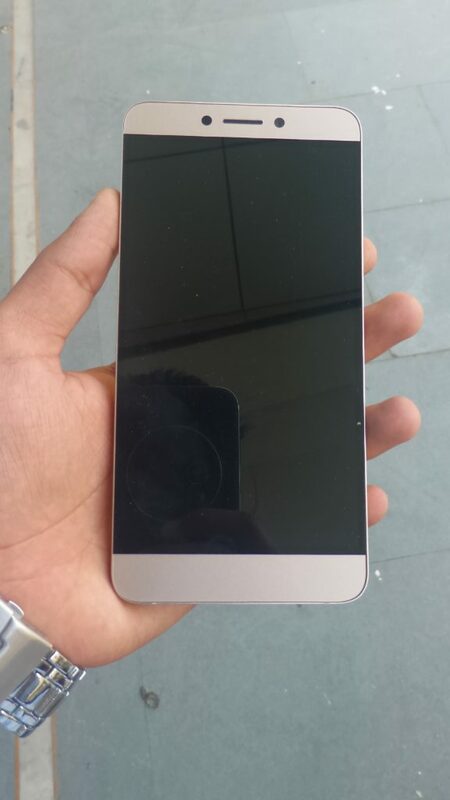 LeEco entered the Indian market recently with two smartphones – LeEco Le 1s and LeEco LeMax. 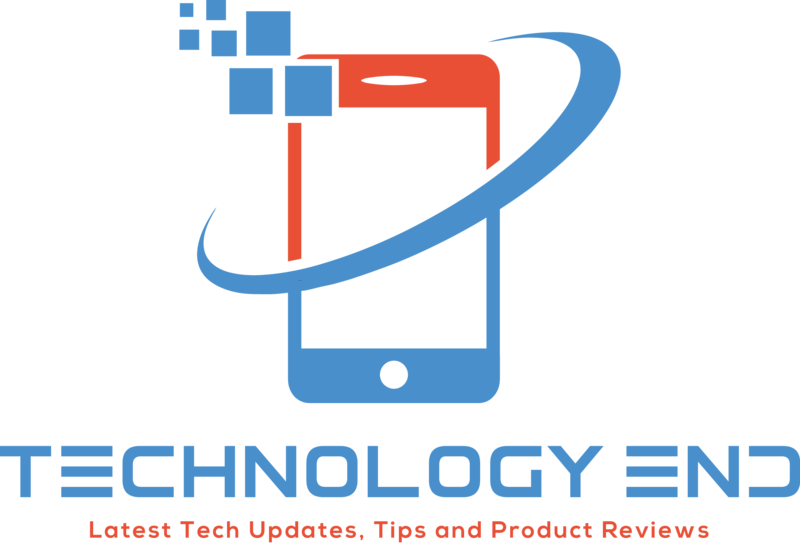 It is soon going to introduce Smart TVs and more products in Indian market depending on its success in Indian smartphone industry. 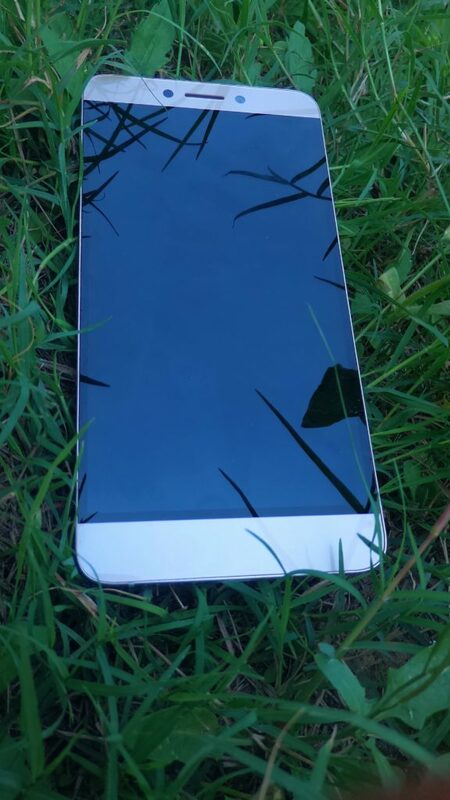 Today, we are going to review LeEco Le 1s and it is surely Bang On! LeEco Le 1s is priced at 10,999 INR and is being exclusively sold on Flipkart through weekly flash sales online. We are really impressed with its power packed performance, awesome build quality and impressive display. But are these enough in this tough competition? We will find out in the review. Le 1s comes in a minimal plain white color box that includes a beautifully crafted Le 1s, USB Type-C cable, wall charging adapter with fast charging supported, user manuals for first time users and a SIM tray ejector tool. 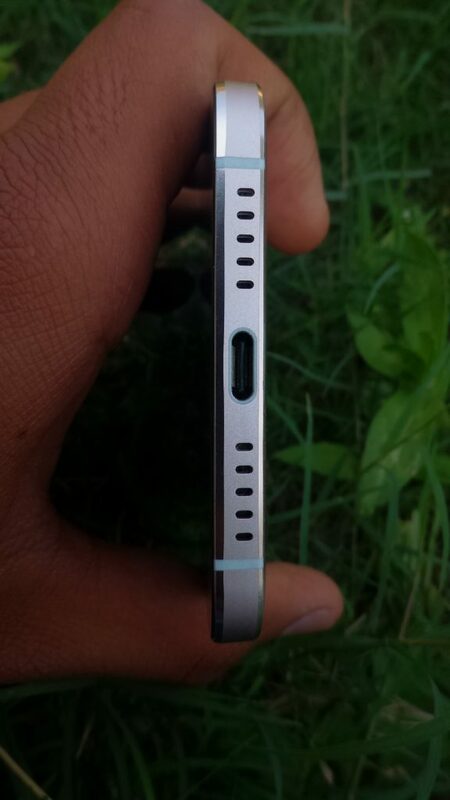 The smartphones comes with USB Type-C which have both positives and negatives. Its fast compared to Micro USB and the smartphone supports fast charging. USB Type-C cable and Adapter is of good quality. However, you need to carry USD Type-C cable wherever you go because other standard Micro USB cables can’t be used to charge the device or Data transfer. Now coming to the device itself, the device is full metal body unibody design with a slim profile which fits in your hands perfectly. As soon as you hold the device, you will realize why we are saying awesome build quality. The build quality is just awesome, it feel premium in hands. It is good from both Front & Back and edges too. It is not that light in weight but you will get used to it once you start using it for sometime. 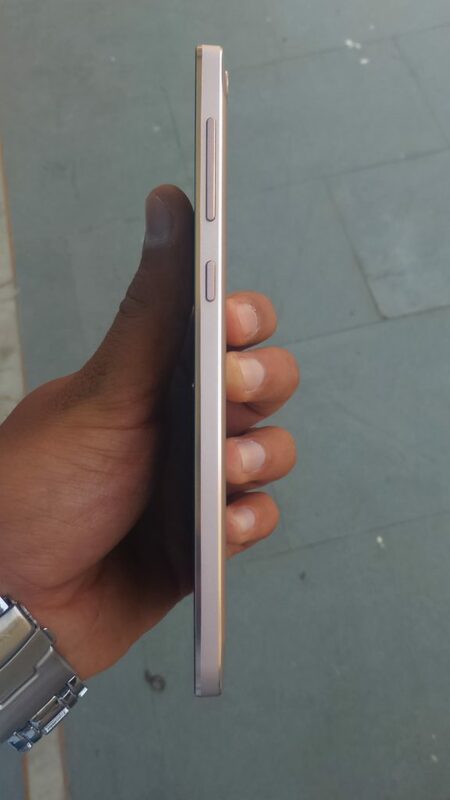 Its metal body and Golden color definitely gives premium touch. In my opinion, it’s one of the best designed smartphones in this price range. Coming to the Design, up front, it is packed with a impressive 5.5 inch Full HD 1080p On-cell display, mail earpiece, a 5MP front camera, proximity and ambient light sensor, down below are the three touch type backlit capacitive buttons. 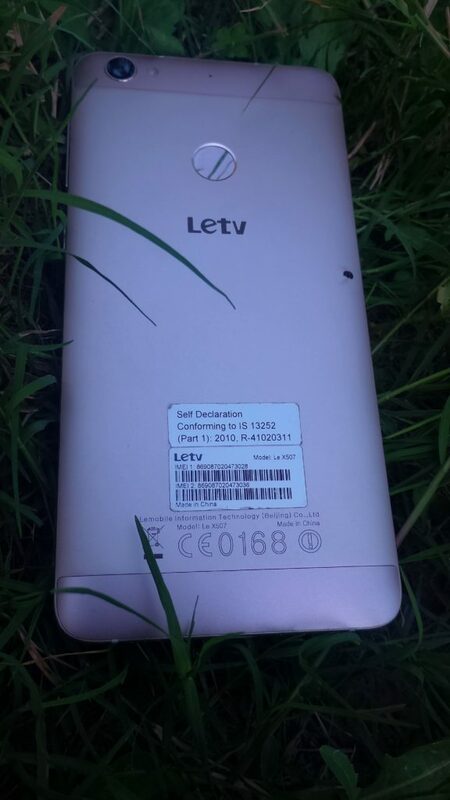 On the rear side, it have a 13MP camera with autofocus and LED flash, a secondary mic and below the camera you will find the fingerprint sensor and also the Letv branding. On the right, it have Power button and Volume rockers; and are made of metal. 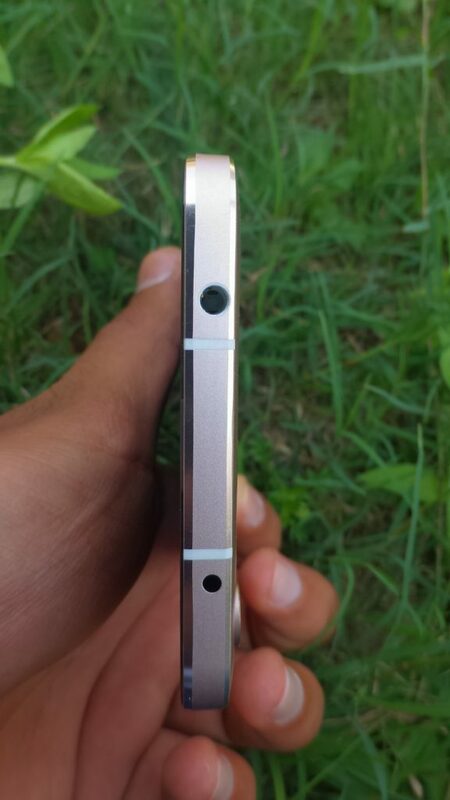 On the Left, it have Dual SIM slot (SIM tray) where you can insert your SIMs in SIM tray with the help of SIM tray ejector tool that comes along. On the top, we have 3.5 mm standard audio jack and IR blaster to control electronic devices like air conditioners, refrigerators. On the bottom, we have speaker grill and USB Type-C port. Its design is awesome with brilliant build quality which one can surely go for. The Le 1s is powered with 5.5-inches Full HD 1920×1080 On-Cell display. The viewing angles are brilliant. 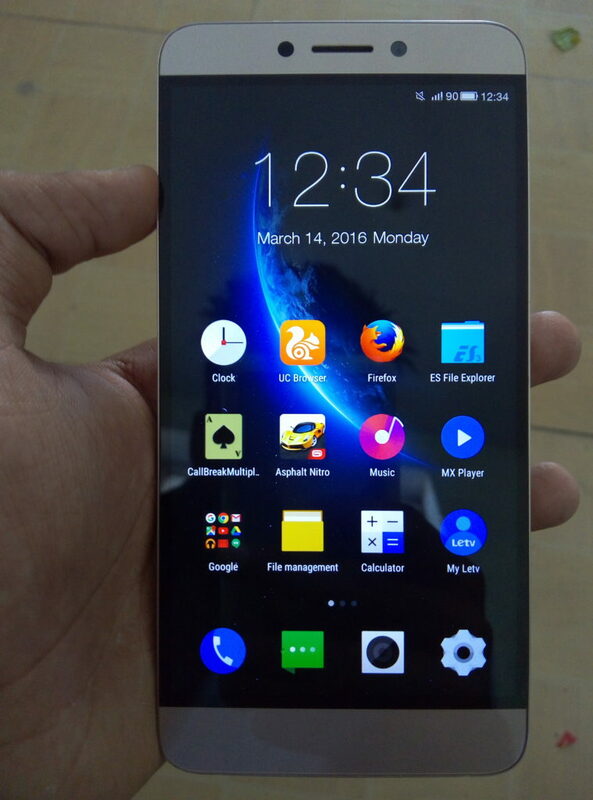 In my opinion, the display of Le 1s is definitely one of the best on any smartphone of upto 15000 INR in price. Color reproduction is accurate and colors are vivid. We didn’t face any problems in sunlight too, we found it bright enough in outdoors. 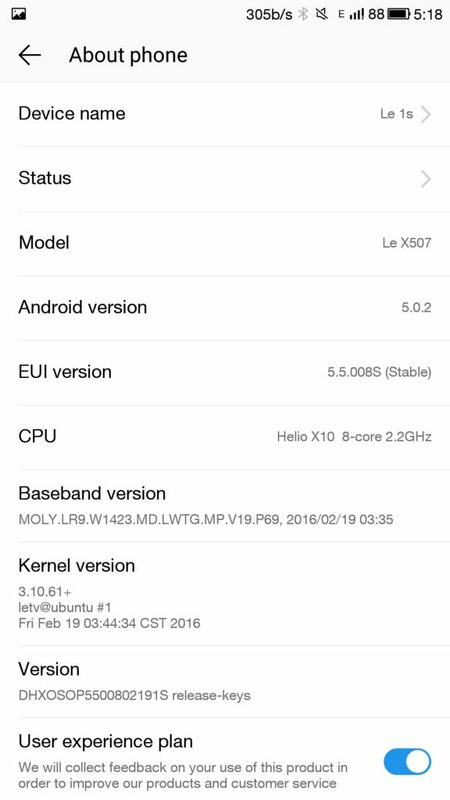 You can also tweak the display settings, you can choose any of the four different modules which are Letv, Vivid, Natural, and Soft respectively. The light sensor is good which help in auto-brightness. So overall, the display is quite good, specially considering its price, no complaints. 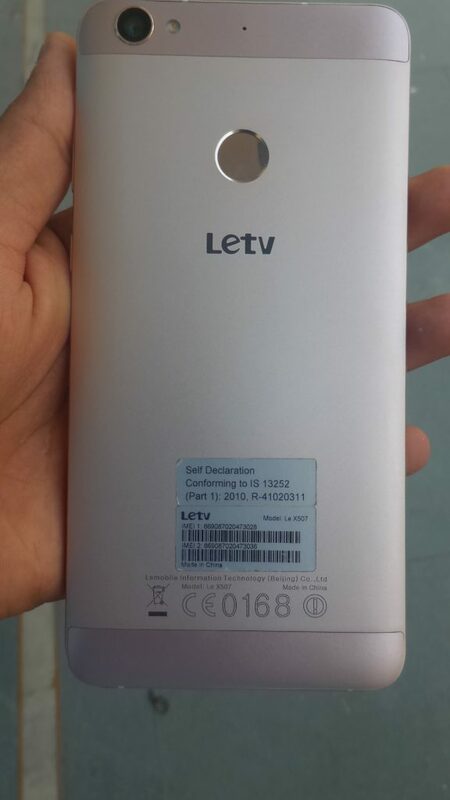 The device runs on Android Lollipop 5.0.2 with the brand’s EUI overlaid on top. 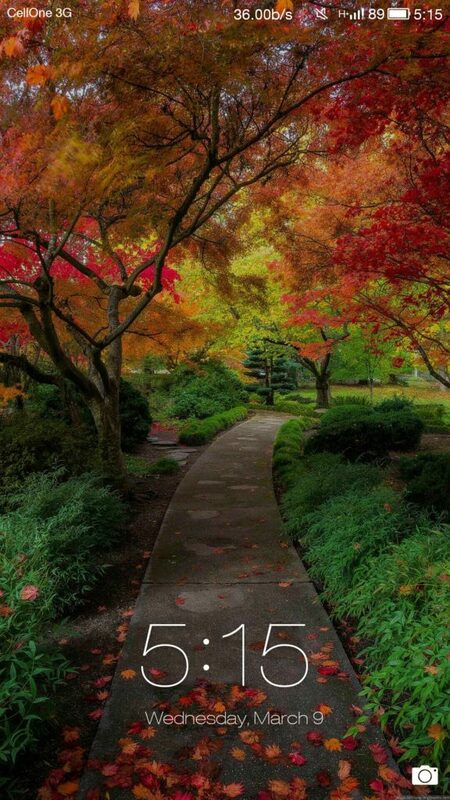 You may need some time to get used to it because its different from usual UIs in many ways, specially status bar and notification bar. 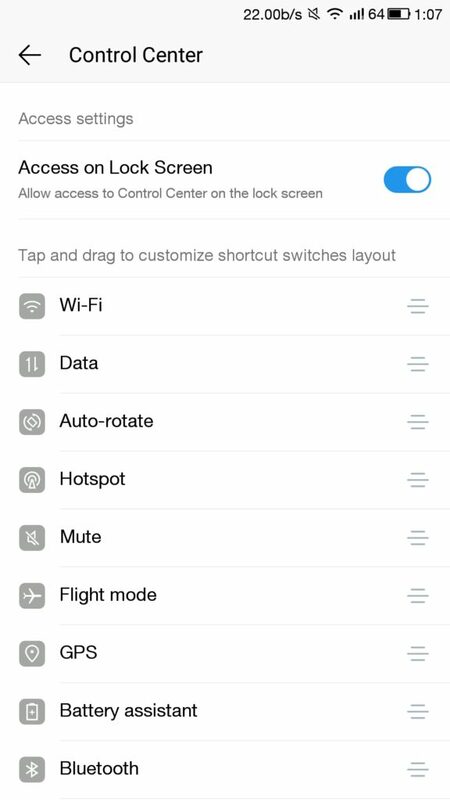 When you press the Left capacitive touch button (Square), there you will find the running apps in the background and control center i.e. quick toggle buttons/shortcuts, which is all different from what we see usually. All the installed apps on the device are arranged on home screen like some popular OEM skins, that means no app drawer by default. However, you always have an option of installing custom launcher to get the things going if you don’t like the apps on home screen. 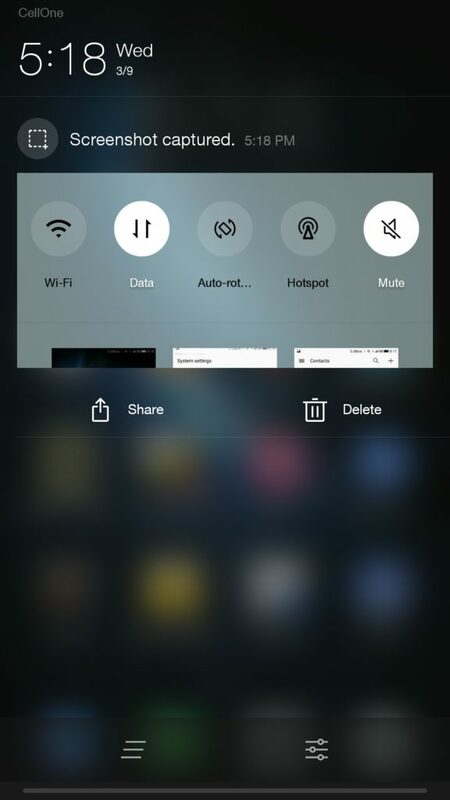 The UI allows you to customize alot of things like Toggle buttons in control center, shortcuts etc. 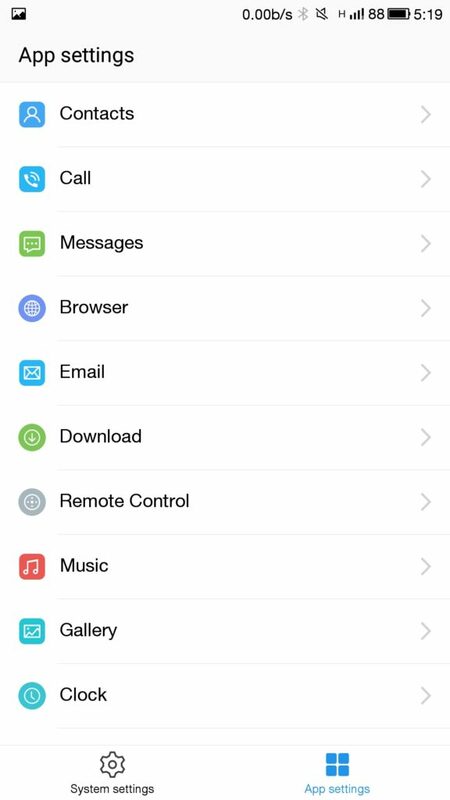 Different themes are available too which you can choose accordingly to change the look and feel on the device. We found the UI simple and quite good in many ways. 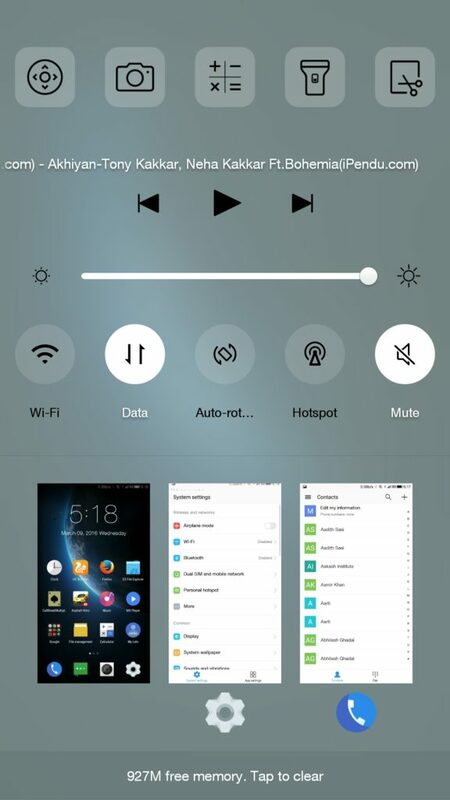 The best part being no bloatware whatsoever except few default LeEco apps. 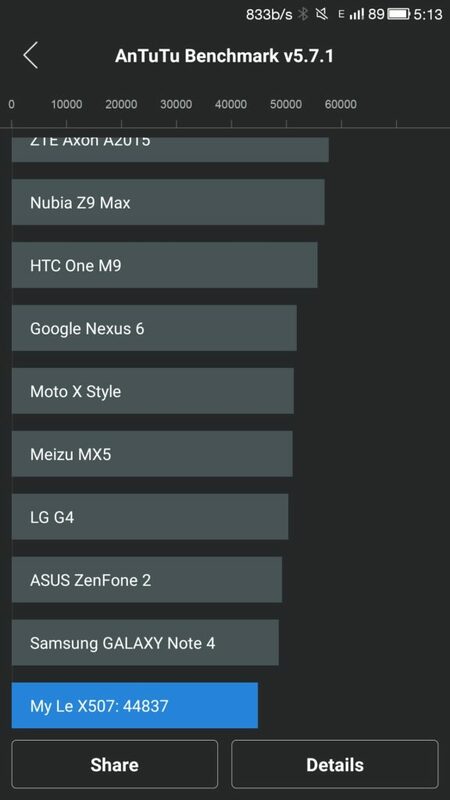 According to recent announcement, the device will be upgraded to Android Marshmallow 6.0 in 2nd quarter this year i.e. late April or May 2016. 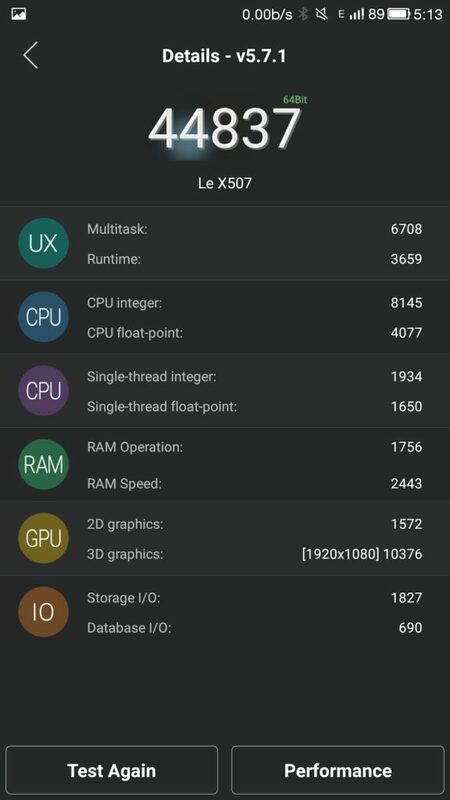 The LeEco Le 1s is powered with octa-core MediaTek Helio X10 chipset with PowerVR Rogue G6200 GPU. The processor is clocked at 2.2Ghz. 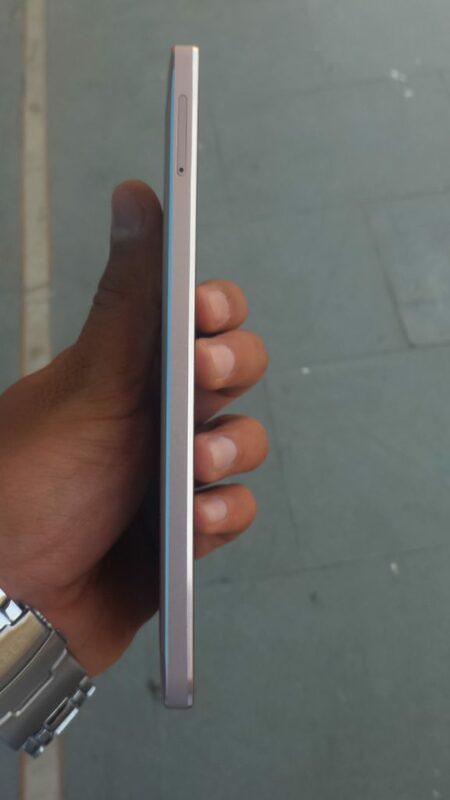 Along with it, it have 3GB of ram and 32GB internal memory which makes the multi-tasking easy and smooth. It didn’t show any lags or stutter in my case. We tried few heavy games and app like asphalt 8, Hitman sniper etc. and they ran smooth without any lags. The device got heated a bit during gaming which is quite normal in every device. Other than that, it was all good. 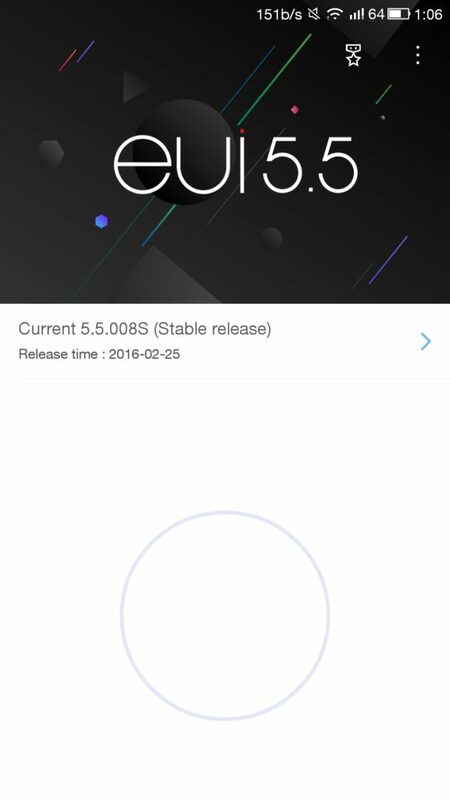 On AnTuTu, the device given score of around 50000 which is far ahead of other devices in this price range. It was all smooth during multi-tasking and it didn’t shut active apps forcefully. App open up quickly and close smoothly too. On the performance part, we will rate it 8.5/10 and we can confidently say it’s the best performer on performance part in this price range. 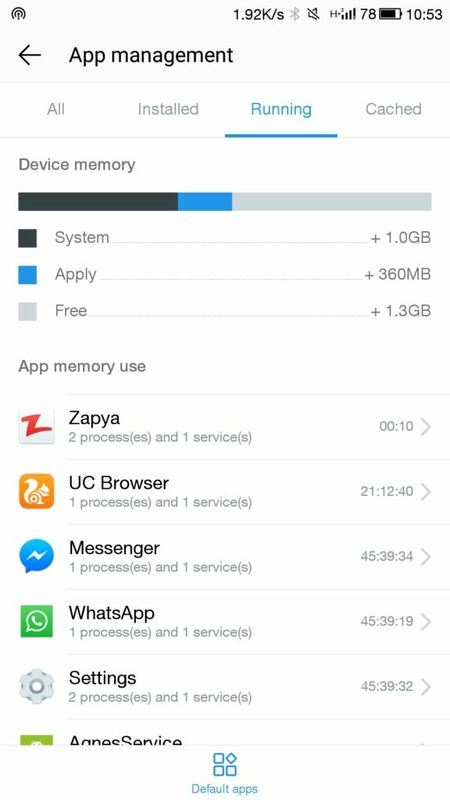 Coming to the storage, the device have 32GB of internal memory, out of which 25GB is available for user. It might not be enough for Music lovers and Movie freak people but it do support OTG so you are good to go. The default camera app is simple with modes Photo, Video, Panorma and Slo-mo. You can also find the other modes under the menu like HDR, Night etc. You can also record 4k videos with rear camera but you shouldn’t expect that much quality, again don’t forget the price you are paying. So overall, the camera is at par considering the price tag. The Le 1s is powered with a non-removable 3000mAH battery which is a average performer. In my case, it lasted for a day without charging which included playing video songs, whatsapp, browsing and a bit of gaming. However, in case we kept Data and Wifi Hotspot enabled for longer time, the battery drained comparatively quickly. Always remember to carry its USB-C type cable and adopter along because you won’t be able to charge it with usual micro-cable charger. 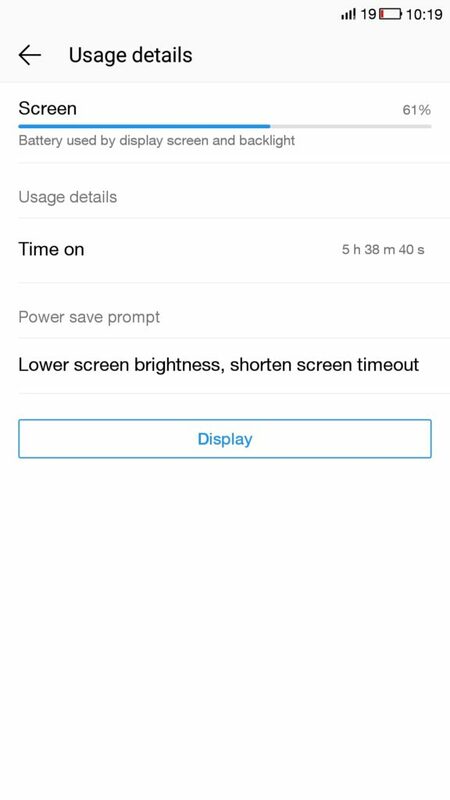 We played the video on Loop in MX Player with full brightness and it gave 5 h 38 m SOT(screen on time) with 19% battery still left. So, we would say not that bad at all however it could be better. The devices comes with a fingerprint sensor at the back below the camera module just like few other devices in this price range like Coolpad Note 3. The fingerprint sensor is well placed and it is super accurate. Fingerprint sensor is something which gives premium touch to the device and it something nice to have on the device. It adds additional security to the device and saves time when unlocking the device unlike patterns or passwords. You can register upto 5 fingers and we can say it was fast and accurate every time. The LeEco Le 1s is powered with Dolby Audio and Dirac HD audio technology that provides awesome audio experience. To improve on the software part, the software opens up a feedback app which is a cool addition. Talking about connectivity features, it have 4G LTE, Bluetooth 4.1, Dual SIM (1 Micro+1 nano), IR blaster, GPS, MHL 2.0. LeEco have announced 555 service centers across 300 towns in India. So, we assume after sales service won’t be a problem either. LeEco also offer free home pickup and drop-off service after sales so that you don’t face any problem to get your device repaired if needed. 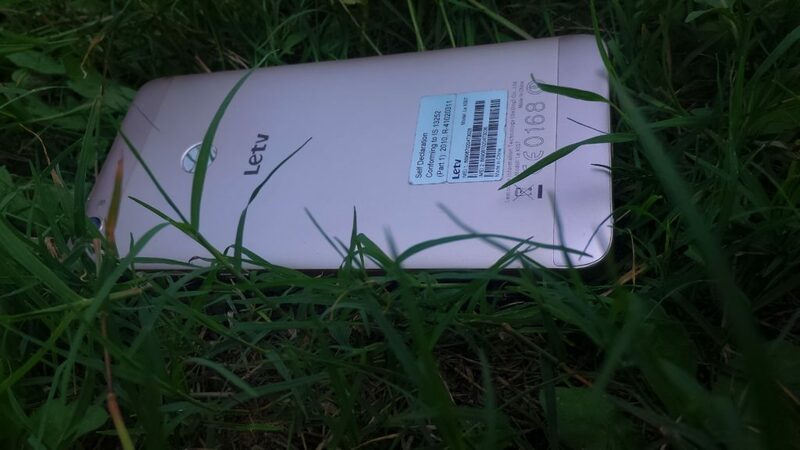 In our opinion, the LeEco Le 1s is an incredible package for the price you pay. It comes with impressive performance, super build quality, good display, fast accurate fingerprint sensor, decent camera and battery in only 10,999 INR. It is a very good deal for the overall package. It run heavy apps smoothly without any lags whatsoever and it feels premium in hands, thanks to its build quality. If we talk about best smartphone in the price range of 11000 or up to 15000, then Le 1s is a clear winner at the moment, go for it without thinking much. Like we mentioned earlier, you are also covered in terms of after sales service and service centers support. They have tied with 555 service centers across 300 towns in India and they also offer free home pickup and drop-off service. For further support, you can also get in touch with their 24*7 call center support and live chats options are also available online. So, you are covered in prospect of after sales service and you can definitely go ahead and buy this one if you are looking for a smartphone in this price range.